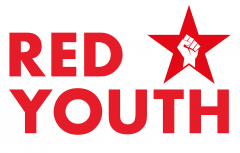 Red Youth expresses full solidarity to Celtic FC supporters who continue to organise against draconian laws, police harassment and the shameful complicity of their club in repressing football fans. 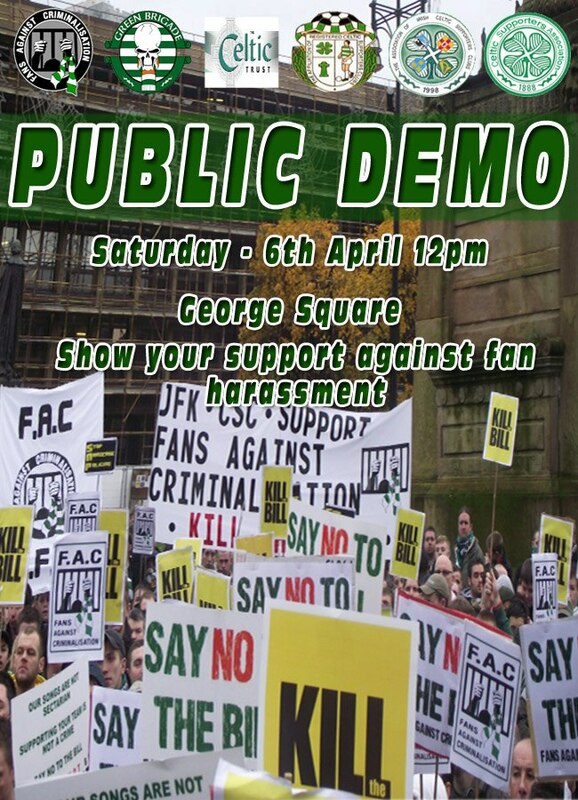 Fans Against Criminalisation (FAC), an independent association comprising of the Green Brigade and several other supporters’ groups, have arranged a rally on George Square, Glasgow, 6 April at 12pm. 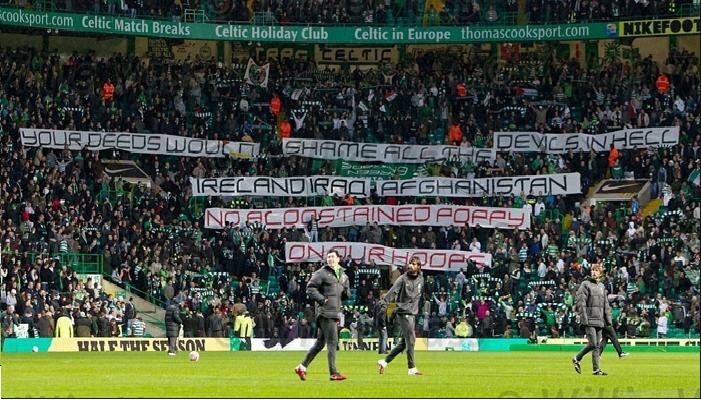 Whilst FAC was originally formed in 2011 to protest the Offensive Behaviour at Football and Threatening Communciations Act, and continue to mobilise fans and wider society against this preposterous, repressive and unworkable bill, tensions have reignited after a number of people were recently banned from Celtic Park without cause or explanation. It has since transpired that Celtic FC have been colluding with Strathclyde Police to target certain individuals and groups. On 16 March, fans responded by organising a corteo to the football stadium to highlight the ongoing harassment and arbitrary bans that supporters face. They were met with heavy-handed policing that resorted to kettling, provocation and the inevitable arrests of supporters, including many under the age of 18. 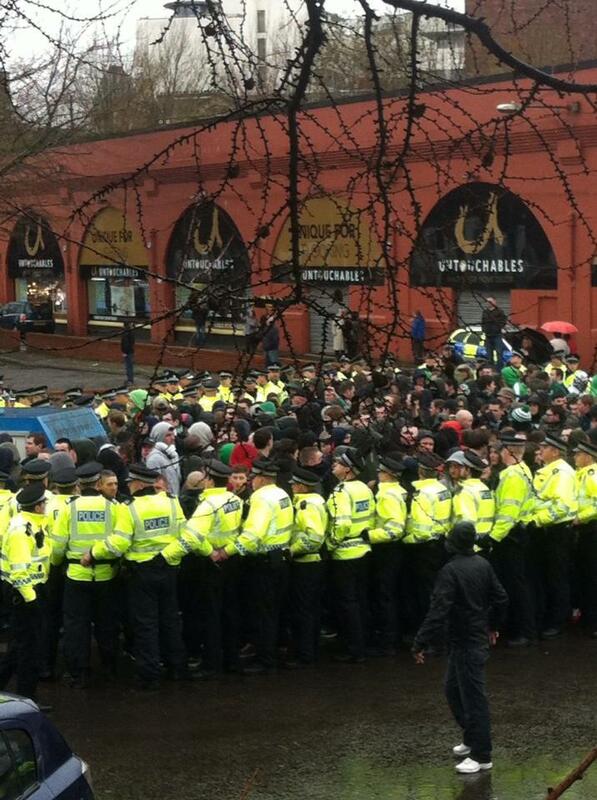 There have been subsequent reports and picture evidence that shows Strathclyde Police intimidating and brutalising fans. Yet, the supporters have refused to be intimidated and have arranged this further demonstration, which we encourage all football fans and progressive groups to support. The Offensive Behaviour at Football and Threatening Communications Act is aimed primarily at the Irish community in Scotland as it seeks to criminalise the support of Irish republicanism and conflate it with the bigotry and sectarianism of unionism. 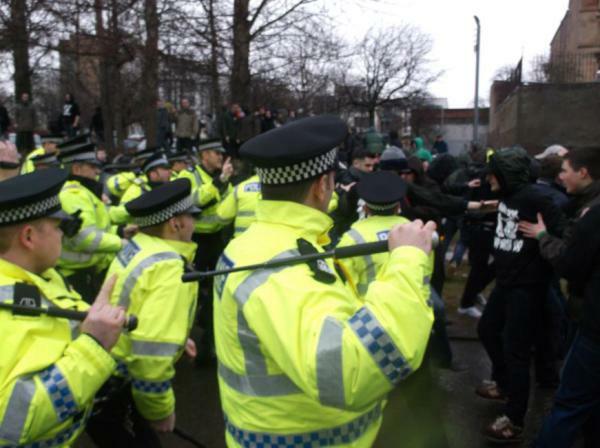 The fans who have been targeted by Celtic FC and Strathclyde Police are largely members of the Green Brigade: a collection of Irish republican, socialist and anti-fascist supporters that have organised to bring atmosphere and passion back to Celtic Park. The Green Brigade’s numbers are relatively small but – by having an overwhelmingly working class membership and an ability to connect football, youth culture and political consciousness – they have been able to influence thousands of young people in the West of Scotland and beyond. The ‘left’ in Britain could learn a great deal. It will not be the mainstream political groups that defend the working class but the independent mobilisation of our ranks. 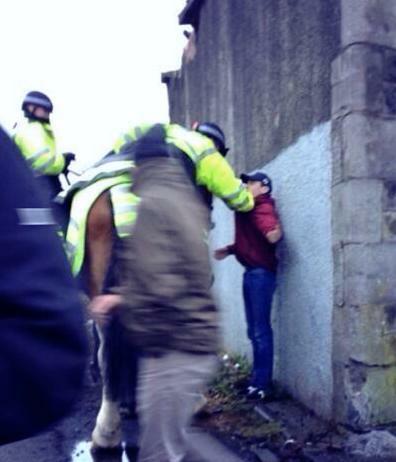 Supporting your club in NOT a crime! Defend the Irish community in Scotland!